The wait is over and the Simple Minded Tournament of Film for 2016 begins now! 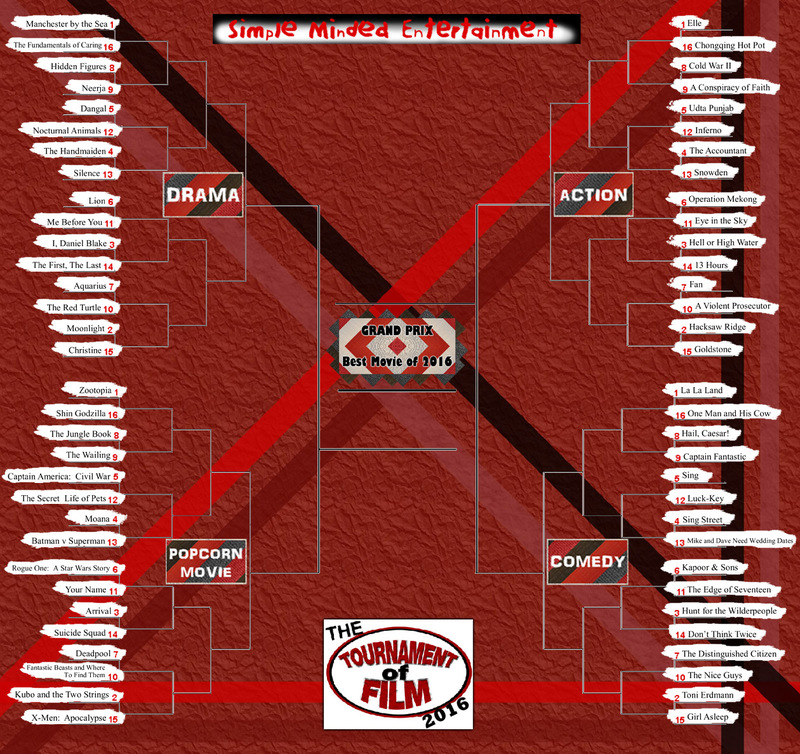 Using our thorough and detailed analysis, we have narrowed down the field to the 64 movies that will take part in the Simple Minded Entertainment Tournament of Film 2016. So without further ado, here’s the bracket with seedings and 1st round match-ups broken down by category (action, comedy, drama and popcorn movies). The rules and the selection process for the tournament are also highlighted below. Let’s begin! – All films that had their initial theatrical release in any country for the Tournament year are eligible. Made for TV movies and films that didn’t get a theatrical release are also eligible as long as they premiered on TV in the Tournament year. – The films are seeded in the tournament according to their point totals. The film with the highest point total in each category is the only automatic entry. All other films are chosen by the committee and placed into any appropriate category and seeded based on point total. – In situations where films have the same point total, the films with equal point totals are seeded at the discretion of the committee using original home country ranking, number of appearances on lists and other factors. The box office charts for the following countries (and others) are used when available: USA, Worldwide, Argentina, Australia, Austria, Belgium, Brazil, Bulgaria, Chile, China, Czech Republic, Denmark, Finland, France, Germany, Greece, Hong Kong, India, Italy, Japan, Lebanon, Lithuania, Mexico, Netherlands, New Zealand, Norway, Philippines, Poland, Portugal, Romania, Russia, Serbia and Montenegro, Slovakia, South Korea, Spain, Sweden, Switzerland, Thailand, Turkey, Ukraine, United Kingdom. All box office data from Box Office Mojo or Wikipedia. -A number 1 position is worth 25 points, a number 2 position is worth 24 points, etc, etc, a number 25 position is worth 1 point. – A best picture win is worth 25 points while a nomination for best picture without winning is worth 10 points. – Films can be moved between categories as we see fit. Different films can fall into two or more categories, so we try our best to make sure each film gets the fairest shot possible to be in the tournament. – When all the point totals are added up, we rank the films in each category according to their score. – The top film in each category/bracket earns an automatic berth in the tournament. – Films can be moved from one category to another to satisfy geographic requirements and at our own discretion. – There are four wild card spots available in the bracket – at our discretion. – The final bracket for the Tournament of Film includes 64 films in 4 sections with 16 films each. – Films are judged in relation to one another. When judging the films one can only look at what is on the screen and the differences between only the 2 films being compared. – All previous work from directors, writers, and actors should be ignored. Unless the film is a shot by shot remake or a blatant rip off of a previous film, only what is on the screen matters. – One cannot make references to other films or to other works. Pretend that these are the only two films in the world and you can only choose one to survive for future generations. – THE ONLY THING THAT MATTERS IS WHAT’S ON THE SCREEN. FORGET THE TOTAL BODY OF WORK OF THOSE INVOLVED. FORGET EVERYTHING ELSE THAT YOU KNOW AND EVERYTHING ELSE THAT YOU HAVE EVER READ, SEEN, OR HEARD! ONLY JUDGE THE TWO FILMS AT HAND. – For each category, one film will be superior to the other. Only one tie is allowed per match-up. The top film in each category gets two points and a tie results in 1 point per film. After the films are judged in all categories, the points are added up and the film with the top score moves on. In case of a tie, which means one of the categories was scored as a tie. The tie in that category must be broken and a superior film should be chosen for that category. 2) Writing/Dialogue – Does the dialogue and actions of the characters help move the story forward toward the ultimate goal of the film. 3) Cinematography – The way the action and the surroundings in the film are captured to move the story along. 4) Production Design/Visuals – The way the movie looks from costumes, to buildings, to the characters themselves. 5) Sound/Music – The quality of the sound and music in the film as it relates to telling the story. 6) Editing/Pacing – The transitions and speed of the movie and how it pushes the story forward. 7) Story/Meaning – What is the film trying to tell us and does it capture our attention. 8) Directing – How the entire film comes together. 9) Time Management – Is the film too short, too long, or just right. Call it the “Goldilocks Variable”. 11) A Film’s Goal – A comedy seeks to make you laugh, a tragedy seeks to make you sad, a horror movie seeks to scare you. How well does the movie accomplish what it sets out to accomplish.